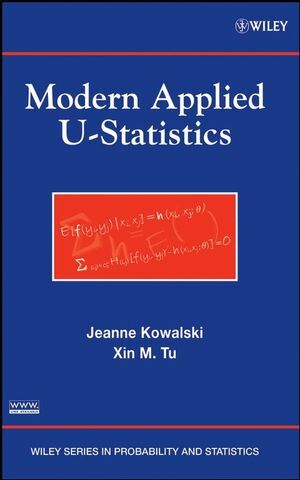 Built on years of collaborative research and academic experience, Modern Applied U-Statistics successfully presents a thorough introduction to the theory of U-statistics using in-depth examples and applications that address contemporary areas of study including biomedical and psychosocial research. Utilizing a "learn by example" approach, this book provides an accessible, yet in-depth, treatment of U-statistics, as well as addresses key concepts in asymptotic theory by integrating translational and cross-disciplinary research. Motivating examples, in-depth illustrations of statistical and model-building concepts, and an extensive discussion of longitudinal study designs strengthen the real-world utility and comprehension of this book. An accompanying Web site features SAS? and S-Plus? program codes, software applications, and additional study data. Modern Applied U-Statistics accommodates second- and third-year students of biostatistics at the graduate level and also serves as an excellent self-study for practitioners in the fields of bioinformatics and psychosocial research. Jeanne Kowalski, PhD, is Assistant Professor in the Division of Oncology Biostatistics at The Johns Hopkins University. Dr. Kowalski has authored or coauthored over thirty journal articles that focus on a wide range of issues in medicine and public health through the use of novel statistical methods, including U-statistics, generalized linear mixed-effects models, generalized estimating equations, asymptotics, and measurement error models. Xin M. Tu, PhD, is Professor in the Department of Biostatistics and Computational Biology as well as the Department of Psychiatry at The University of Rochester in New York. Dr. Tu has authored or coauthored over ninety publications in peer-reviewed journals during his career and is acclaimed as one of the best-versed authorities in the area of U-statistics. 2. Models for Cross-Sectional Data. 4. Models for Clustered Data. The level of accessibility and the variety of timely applications that demonstrate the utility and power of the hybrid inference paradigm are unique to this volume. The scope of applications of the U-Statistics theory is more broadly defined than seen in other books. Emphasis is placed on nonparametric applications when and where appropriate. The large number of motivating examples and real study applications in genetics, sequencing data, cDNA, protein arrays, biomedical and psychological research, as well as the concrete steps needed to apply the theory to practical problems, serves to strengthen the utility and comprehension of the book. The use of case studies throughout the book underscores the real-life nature of the content. The unusual inclusion of certain topics such as repeated measurements and clustered data make the book timely and modern. The appendix of the book and a soon-to-be posted .ftp site provide several computer codes for producing the results that are discussed in the book.